As the long holiday weekend approaches I know a lot of poker players that are looking forward to some extra time at the tables over the next few days. Tournaments are a good way to win some cash without risking much and Intertops Poker & Juicy Stakes have added a couple of good ones. First there's the $2 Easter Bounce on Good Friday. Then there's a $300 guaranteed free roll on Tax Day (Tuesday). 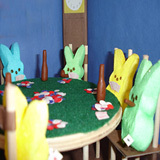 Buy-in for Friday’s $2 Easter Bounce is only $2.00 + $.20. There are no re-buys or add-ons. There will be a fifty cent bounty per player. Players will start with 3000 chips and blind levels will be ten minutes. Late registration will be allowed for 90 minutes. $2 Easter Bounce will be on Good Friday and there will be a $300 GTD Tax Day Free Roll. Americans normally have until April 15 to pay their income taxes but since the 15th is a Saturday this year, and the Monday is Emancipation Day, the tax deadline is delayed until April 18th. It may be postponed but it's still no fun paying taxes, is it? To ease the tax pain, Intertops and Juicy Stakes will host their $300 GTD Tax Day Free Roll that day at 8:15 pm Eastern. Players will start with 2000 chips and there will be unlimited re-buys ($.30). Blind levels will be ten minutes and late registration is available for 30 minutes. Both Intertops Poker and Juicy Stakes welcome players from anywhere in the world. If you play slots but don't win this weekend, take advantage of the poker rooms' Easter Cash Back offer and get 35% of your last deposit refunded. Also check out the European Poker Championship satellite tournaments that begin today -- maybe you'll win your way to Austria!